“(The trainers) keep track of my skill set and and help me to improve with each exercise,” Autumn says. Autumn Brightwell was always an athlete. She kept busy in high school, playing a variety of sports, and continued to be active throughout college. After school, however, when she settled into adult life at an architecture firm, she began to spend more time at a desk than on a softball field or volleyball court. 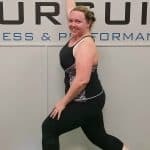 Knowing it was time for a change, Autumn joined a “typical” gym, but it just wasn’t working for her. HOBBIES? Hanging out with friends (going to dinner or movies), visiting family, reading and sketching.